The Country Club course at Durban Country Club is universally considered to be one of the finest layouts in South Africa and it is regularly ranked as one of the World’s Top 100 golf courses. The experience is unforgettable and it has played host to seventeen South African Opens, more than any other golf course in the land. No wonder it’s riding high in our South African rankings. Dublin-native Fergal O’Leary proved the catch-phrase ‘luck of the Irish’ and became the youngest man in history to play the World’s Top 100 Golf Courses. The 32-year old concluded his quest at the Durban Country Club in South Africa on the 17th August 2015. Click here to read the full story or watch the video below. Durban is part of Africa's Zulu Kingdom and it’s a bewitching seaside playground in the province known as KwaZulu-Natal. Amidst the hustle and bustle of this cosmopolitan city lies the serenity and calm of Durban Country Club. The Country Club course is set on the edge of the Indian Ocean hidden behind a high ridge of sand dunes and the holes undulate beautifully through lush and intimidating tropical vegetation. According to the late author and historian, Michael Hobbs, "the original architect was Laurie Waters, in 1920. His course has remained basically little changed although many later architects, including S.V. Hotchkin from Woodhall Spa and Bob Grimsdell, late in the 1950s, have had a hand in it." Many believe that the opening five holes at Durban Country Club represent the best start in the world. The 1st hole, a par four measuring 390 metres from the tips is a daunting start to any round and we’re certain that it has struck fears into the hearts of many hardened pros competing in the SA Open. You can hear the Indian Ocean clearly from the tricky par three 2nd, which is perched on the high ground. The small elevated green is guarded ferociously by four bunkers… take your par here and move on to the 3rd tee, an absolutely stunning par five which is set in a valley in the dunes. Play this hole conservatively otherwise you may be looking at a bogey or worse. The back nine plays across flatter ground than the rollercoaster of a front nine but nevertheless the back is good golf indeed. A great deal of water has gone under the metaphorical bridge since Laurie Waters and George Waterman laid out Durban Country Club in 1922. Long gone are the days of apartheid and positive change is still happening across the stunning Rainbow Nation. But we take our hat off to Durban Country Club who have unveiled a memorial plaque in recognition of the amazing achievements of legendary Sewsunker "Papwa" Sewgolum, a self-taught cack-hander who, in 1963, became the first coloured golfer to win a professional golf tournament in South Africa. I played this course in the Durban winter, although admittedly it reached 27 degrees Celsius! The first 5 holes are literally some of the best holes you will find in golf. Elevated tee boxes, undulating fairways, beautiful views and challenging shots with risk/reward considerations. What an unbelievable start! The Par 3 2nd and Par 5 3rd are my favourite of the 5. The Par 3 12th is a gem of a hole which punishes you if you don't find the green as it sits on a plateau. The closing 2 holes are my personal favourites on this course. The 17th is amazing in that the fairway undulates ridiculously, leaving you either a downhill or uphill shot depending on where your tee shot lands. The 18th is my favourite finishing hole in the world - a par 4 only requiring a 3-wood for myself to reach the green in 1 but the landing area is very narrow and will ruin your scorecard if you decide to take it on and land up hitting out of bounce (long or right). What a lovely experience! At no point in my round did it feel like I was a stones throw away from the bustling city of Durban. I seriously would recommend any golfer visiting South Africa to make their way down to this lovely course. The only reason I don't rate this course as excellent as there are a few holes in the middle 6 which are not very memorable and are quite short. Perhaps a different test when the wind is howling? I liked Durban Country Club as a golf course, although it does not have 18 strong holes. It has a particularly strong start, especially the first five holes that are narrow, hilly holes that play in the bush. The middle holes, 9-15 are average at best, but the course has a strong finish with the last three holes. The front nine are near the Indian Ocean and thus are more impacted by the wind. The course is not directly on the ocean; there is a busy and loud highway that runs between the course and the ocean. On the first day I played there were many windsurfers and parasailers out on the water enjoying the strong wind, which usually isn't a good sign for golf, but it turned out ok. The back nine is away from the water and not as impacted by the wind. The massive Durban Stadium towers over a couple of holes on the back nine. One of the defining characteristics of Durban Country Club are the massive undulations in the fairways, especially the 5th, 8th and 17th. The course was built on sand dunes and they are large and interesting. 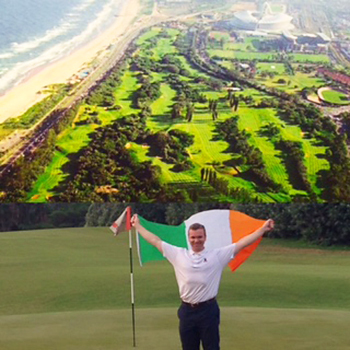 At Durban, you don't have trouble in the traditional sense we find it in the U.S. or British Isles. Off many of the fairways is thick sub-tropical vegetation. This bush is pretty much unplayable if your ball goes in it. The par five third hole is one of the best in the world I have had the privilege to play. It has a high elevated tee with a view of the Indian Ocean. You hit down a narrow valley surrounded on both sides by thick bush. When you are down in the fairway you can't hear any external noise, including the ocean or the highway. The 17th fairway has the craziest undulations of any course I have ever played. Durban is a unique experience in the game and worth the long trip to play it. GOLF Magazine published their first Top 100 courses in the World list in 1985. Durban Country Club is among those elite clubs that have stayed on the list since the beginning. The iconic landscape of the undulating Durban topology is the catalyst for such lofty global praise. As you walk off the first tee, the land begins to take over and you enter the gauntlet of humps and bumps along the opening fairway. Much dialogue surrounds the opening 5 holes, and the course deserves every ounce of the credit it receives by golfing critics around the world. Having just spent 4 days at Kruger National Park, the memories of ‘Elephant Burial Grounds’ returned to my head as I walked the undulating opening stretch at this old masterpiece. Naturally raised land-forms and beautifully exposed mounds echo effortlessly throughout this golfing amphitheater. Not only is this course stunning, but it is a fierce test worthy of the National Open. One is easily distracted standing on the elevated tee-boxes; however the treachery that waits below you shows little to no mercy if you decide to flirt with its sharp teeth. The downhill par 3 2nd hole is among the finest short holes in the world, followed by the world famous par 5 3rd hole which has cemented its place on the pedestal of epic par 5s. It’s the poster-child image of Durban Country Club, and for good reason. The par 3 4th hole is framed beautifully by the adjacent mounds and continues to demand a high degree of skill to hit the small target. Depending the wind direction, which is always a significant factor at Durban, I considered the 5th hole as the toughest par 4 on the course, if not the country, with its tight tee shot, lurking hazards and distance measuring close to 450 yards. 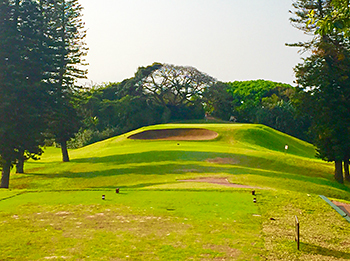 It’s not uncommon on certain holes at Durban to hit the fairway with your tee shot and have a blind approach shot due to the magnificence of certain mounds dominating the fairways. The land begins to settle as you move away from the clubhouse (note: the first 5 holes all go in the same direction along the shore), but the quality continues at a very high level. I confidently suggested that the par 5 8th hole is superior than the 3rd, which only fuels the fire of healthy golfing debate and further promotes the quality of golf away from the Colonial clubhouse. I was really enamored by the par 4 11th hole which is a long dog-leg right that oozes difficulty. How could such a beautiful course never let up? That’s the key to success. As an Irishman, I had a wry smile on my face when I heard the story of how the iconic par 3 12th hole got its regal name – ‘The Prince of Wales’ - following an unfortunate series of events many decades ago on this devilishly perched green. This treachery of this short hole quickly removes the feeling of royalty! When you look at the old photographs of the course from the 1930s/1940s, you quickly begin to realise how certain holes on the back-nine are very different than they are presented today. Bunkers have been removed and reshaped, trees have been planted and fairways realigned. Despite my youth, the grizzled old architecture critic inside of me began to ponder the decisions over time that has impacted such history. For example, holes like 13 and 14 have changed from the original design when you compare them to old photos, and the disappointing par 3 15th hole just doesn’t fit well with any other hole on the course as the pond looks like an out of place after-thought. With a determined effort currently underway to clear away unattractive, unnatural and unnecessary trees, scrub and bushes, the ability to expose original mounding and return the course (within reason) to how it looked and played in the 1930s can only do this layout a world of good. The untapped potential lying silently along the Durban shore is waiting for a glorious South African renaissance. The finishing stretch at Durban Country Club requires you to fasten your seatbelt and r eturn your seat to the upright position as the turbulent topology is back in all its glory. The par 4 17th and 18th holes are golfing legends in their own right with wonderful changes in elevation. Hugely moving landforms govern these fabulously rollicking fairways. You stand on top of a mound and could be 20 feet above your playing partners. The 17th fairway is not for the faint-hearted. The drivable 18th hole at just 275 yards has broken many hearts of those competing for the title of South African Open champion. With the fairytale “Dalton Bunker” guarding the front-right side of the narrow putting surface, it has a veracious appetite for golf balls like those monkeys up the trees eyeing your lunchbox. Club-selection on the 18th tee is almost pot-luck as the fate of your golf ball is mostly dictated by the bounce on this fiercely mounded fairway. With just 275 yards between you and your well-deserved drink, the 19th hole has never seemed so far away! For keen golfers around the world, a round at the Durban Country Club is an experience which is not to be missed. You’ll be met by the country’s warmest hospitality and world class service. Admittedly I played here in the late 1990’s but it felt like going back in time. Lovely colonial feel to the clubhouse, superb service and a wonderful golf course. With the Indian Ocean within a mid iron from some of the tees – there are some great views.The whole place has a sense of calm and the course is a bit quirky but superb to play. It’s a links course that feels a bit like a parkland course in places – not overly long but you’ll need to be straight off the tee otherwise you’ll have no choice but to punch out from the trees. I had the good fortune to play this Course in January 2005, the Pro Am before the SA Open which Tim Clark won. A treacherous opening hole, although we began on the 10th, got 2 birdies between us on the 18th, our 9th, before reaching that hole - 2 lost balls, and two double bogies. Endless variety, some would say an old fashioned classic within the City - no artificial lakes, just crafted from the original terrain. I was a junior member of Durban Country Club for 2 years before moving to the UK. I would recommend to anyone travelling to the East Coast of South Africa to put this course at the very top of their "TO PLAY" list! Absolutely awesome course.